We welcome beginners and hold ten week 'Couch to 5K' training courses. Click here for more information. Members meet regularly every Tuesday and Thursday evening outside Applemore Recreation Centre for structured training sessions. In the summer months we train in the New Forest and during the winter we use the local roads around Hythe and Dibden Purlieu. Please remember to wear a Hi-Viz and Reflective vest when the evenings are gloomy. Your safety is important! Here's the current training schedule which runs though to 2 May. We are advised for safety reasons that all pedestrians ( those running to the session ) use the side gate at Hardley School. Please be ready to run at 6.30pm. New runners are welcome to just turn up and try us out before joining the club. However you do need to be able to run a continuous 5k to benefit from our training sessions. Please feel free to contact us with any questions beforehand. If weather conditions are poor on Training nights could all runners meet at Applemore Recreation Centre rather than the training area as the schedule may change from that shown on the website. Hardley Runners provides coaching at all training sessions, if you are interested in becoming a coach, please read the document here. Here are results of our 5K time trials in Noads Way on an Excel spreadheet so you can sort them to your heart's content. They include results of the time trial on Tuesday 12 March 2019. Coach Chris Harris says, "It was an excellent number of people on a lovely evening at our one mile time trail on the track at Hardley on 24 May 2017. A Huge thanks to Leonnora for giving up her run to help me record the times which you can see here (PDF)"
Here's our pace chart. To use the chart you pick your target time for a distance (e.g. 50mins for a 10km) and then the chart tells you that to achieve that you need to be doing each 800m in 4 minutes. Its not telling you that if you can run a 10km in 50mins that you'll be able to run a marathon in 3.31. It's telling you that to achieve 3.31 you need to be running multiple 10kms in 50 minutes. We use the chart to work out target lap times when doing repetitions of 400m, 800m or 1 mile. We pick a target time for each lap based upon what race distance and time each individual is aiming for. Lots of our members do parkruns at 9am of Saturday mornings (see Race Diary tab for details). We also meet every Sunday morning for a medium to steady run of between five and ten miles in the New Forest (venues and start times agreed through the week). Contact Ray Noke to find out more and to be added to the distribution list for the Sunday runs, on 07796 370674 or ray.noke@hotmail.co.uk. Sunday runs tend to be larger and will split into medium and steady groups with runs anywhere between 5 and 8 miles normally being ready to run at 8:30 am. Please also ask any of the coaches on the Tuesday and Thursday sessions about these runs, they are not training sessions and are easy runs with the emphasis on social and fun. For anyone wanting a longer run there may be an option to run out to meet the Sunday group from Applemore though an earlier start is required, depending on where in the Forest we meet up. Please contact Adrian on 07831790086 or adrian@mudle.com. Ray Noke leads social runs on Thursday evenings in the summer. In addition he leads social runs on Tuesday evenings and Linda leads social runs from Dibden Inclosure car park on Thursday mornings at 08.30. Click on the Social tab above for more information. Please click on the little picture to get the big message. 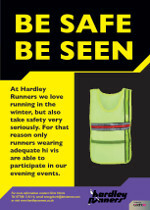 UK Athletics has advised that Hardley's Third Party Liability insurance could be invalidated if an accident was caused during a nightime club training session by one of our runners not wearing high visibility clothing. For future training sessions it will be COMPULSORY for all runners to wear high visibility bibs if they wish to join the Hardley groups. Bibs can be purchased from the Hardley kit store and there are 'club' bibs which can be borrowed if you have forgotten your own. Or you can get a suitable bib from Amazon . If you are also running (or cycling) on public roads by yourself you are advised to protect yourself and others by wearing a high vis bib. Most proprietary running clothes do not have enough retro-reflective material for adequate safety. Be safe - be seen! The contents of this site are © Hardley Runners unless otherwise stated.